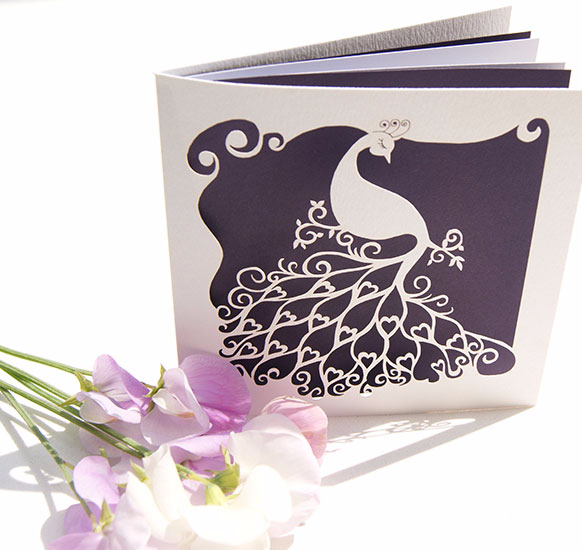 We’re not sure you could get any more romantic than this beautiful Art Deco Peacock wedding invitation! With lots of interesting connotations, the Art Deco Peacock design is the perfect way to invite your guests to your big day! Firstly, did you know that the male peafowl’s (the peacock’s) long tail is called a ‘train’? Pretty apt, especially if you’re planning on sporting a long train on your wedding dress! The tail on this peacock is suitably loved-up, with over a dozen carefully laser-cut love hearts making up the flamboyant fan of feathers. If that wasn’t enough of a sign that this is the perfect wedding invitation, what if we told you that a group of peafowl are called a party? Yes, that’s right, just like your group of wedding guests, a group of these majestic birds are called a party, or a pride! With the choice of two card colour options and a long list of beautiful inlay colours to choose from, you can really add that personal touch to your wedding invitations. If you’re looking to add extra glitz and glam, why not opt for a few diamantes or pearls carefully placed to enhance the beauty of the peacock? Are you planning a wedding with an exotic theme? Perhaps you’re taking inspiration from your Asian roots, or you might even be taking on a spiritual influence – in which case, the fact that peafowl is the national bird of India and is seen as a sacred bird in Hinduism as well as symbolising the eyes of the gods, means this design is perfect! In fact, you probably won’t find a wedding card with as many special meanings as this! Order from The Hummingbird Card Company. Tags: Exotic, Peacock, Plum, Pretty.